Gay Marriage: Is California's Supreme Court Shifting? When a Jewish boy turns 13, he heads to a temple for a deeply meaningful rite of passage, his bar mitzvah. When a Catholic girl reaches about the same age, she stands in front of the local bishop, who touches her forehead with holy oil as she is confirmed into a 2,000-year-old faith tradition. But missing in each of those cases  and in countless others of equal religious importance  is any role for government. There is no baptism certificate issued by the local courthouse and no federal tax benefit attached to the confessional booth, the into-the-water-and-out born-again ceremony or any of the other sacraments that believers hold sacred. Instead, give gay and straight couples alike the same license, a certificate confirming them as a family, and call it a civil union  anything, really, other than marriage. 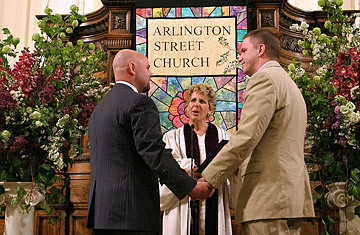 For people who feel the word marriage is important, the next stop after the courthouse could be the church, where they could bless their union with all the religious ceremony they wanted. Religions would lose nothing of their role in sanctioning the kinds of unions that they find in keeping with their tenets. And for nonbelievers and those who find the word marriage less important, the civil-union license issued by the state would be all they needed to unlock the benefits reserved in most states and in federal law for married couples. "While new terminology for all may at first seem awkward  mostly in greeting-card shops  [it] dovetails with the court's important responsibility to reaffirm the unfettered freedom of all faiths to extend the nomenclature of marriage as their traditions allow," wrote Douglas W. Kmiec and Shelley Ross Saxer. Kmiec voted for Prop 8 because of his belief in the teachings of the Catholic Church and his notion of religious liberty but has since said he thinks the courts should not allow one group of Californians to marry while denying the privilege to others. Both sets of lawyers agreed that the idea would resolve the equal-protection issue. Take the state out of the marriage business and then both kinds of couples  straight and gay  would be treated the same. Even Ken Starr, the Pepperdine law dean and former Whitewater independent counsel who argued in favor of Prop 8, agreed that the idea would solve the legal issues, though he said it was a solution that lies outside the legal authority of the court. An attorney for the other side, Michael Maroko, didn't expressly endorse the idea, but he told Chin, "If you're in the marriage business, do it equally. And if you're not going to do it equally, get out of the business." The two Pepperdine professors are arguing that the court should use that line of thinking in crafting its decision in the case before it, short-circuiting the need for a new referendum. Their proposal is aimed at helping speed a resolution on the issue in other states  gay marriage is heating up in Iowa, Connecticut, Vermont and elsewhere  and at the federal level. All sides on the debate expect the issues bubbling up out of the state courts and legislatures to eventually gain traction in federal courts too, ultimately leading to a case before the Supreme Court or efforts to amend the U.S. Constitution or both. But as Solomonic as the compromise seems, giving up the word marriage may be impossible. For many couples joined in matrimony, having the state no longer call them married may make them feel as if something important had been taken away  even if it's hard to define just what was lost. And for many others  the folks who feel most strongly about marriage and most passionately supported the expensive campaign to defeat gay marriage  the issue of nomenclature is only the beginning. They are against not just gay marriage but also gay couples  and especially against government sanctioning of those relationships, no matter what they are called. And as Chin considers whether he can craft a compromise with his fellow justices that would both uphold Prop 8  and therefore the right of the people to amend the state constitution  and assert the right of gay people to be treated equally, he may find that the folks who cling hardest to marriage are gay couples. After all, what was the most sweeping part of the May 2008 decision Ming and his colleagues issued that granted gays the right to marry? It was the idea that the word marriage is so strong that denying it to gay couples violates the most sacred right enshrined in the state constitution: the right for all people to be treated with dignity and fairness. Just 10 months later, gay couples  whether or not they are among the 18,000 who married in the state before Prop 8 stopped the ceremonies  are loath to lose a word for which so many fought so hard and so long to have apply to themselves. But the Pepperdine idea puts into a play a new way of thinking  and whether it's part of the court's decision in the Prop 8 case or whether it makes its way into a new referendum, the idea of getting governments out of the marriage business offers a creative way of thinking about a problem that is otherwise likely to be around for a long, long time. See a story about the U.S. Supreme Court's gay-rights legacy. What happens when you're on the gay-rights enemies list. Is California's Supreme Court shifting on gay marriage?